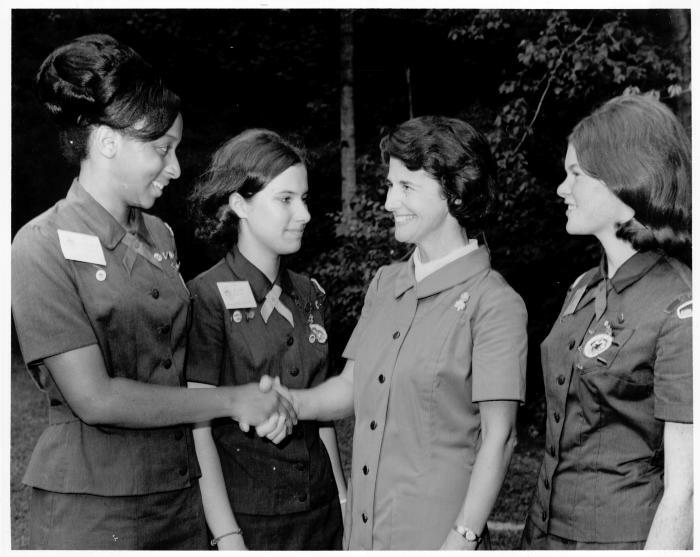 Ms. Jane Freeman, national president of Girl Scouts of the USA from 1978 to 1984, meets with three Girl Scouts. We at Girl Scouts of the USA (GSUSA) were saddened to learn of the recent passing of Ms. Jane Freeman, who served GSUSA as its national president for six years, from 1978 to 1984, after serving on GSUSA’s national board starting in 1966. Her earliest roots with Girl Scouts began when she joined as a young Girl Scout Brownie in Winston-Salem, North Carolina. She then continued her membership throughout high school in Minnesota, where she eventually graduated from the University of Minnesota with a bachelor of arts degree in political science. In addition to her service to Girl Scouts, she supported several national and international humanitarian causes, including CARE, the United Nations, and UNICEF, embodying the Girl Scout mission throughout her life by striving to make the world a better place. Her legacy in the Girl Scout Movement also endures at the Edith Macy Conference Center. She oversaw the development of “Macy,” as Girl Scouts affectionately call this beautiful 400-acre wooded property, into a year-round training and educational facility. Macy celebrated its 35th anniversary in its current incarnation last year and continues to thrive as a place for Girl Scout volunteers and staff members, as well as for other nonprofits and for-profits, to meet and participate in educational opportunities. 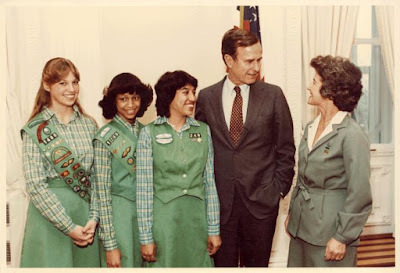 Ms. Jane Freeman, national president of Girl Scouts of the USA from 1978 to 1984, meets with three Girl Scouts and President George H. W. Bush. In addition, under her leadership as national president, Girl Scouts launched a new level of Girl Scouting: Girl Scouts Daisies, the youngest girls served, in kindergarten and first grade. This was part of the organization’s vision to continually evolve to best serve the needs of contemporary girls and their families, something Girl Scouts proudly continues to do today. Most importantly, in Ms. Freeman’s faithful dedication to Girl Scouts’ mission, she had a positive influence on millions of girls’ lives, who in turn have made positive change in their communities and our country. We are extremely grateful for all that she did for the Girl Scout Movement. We know her tremendous legacy lives on in the countless Girl Scouts she inspired with her decades of public service to her country and its citizens, especially girls, and hope this is of some comfort to her family and loved ones at this time.